On this writing assignment the topic was “edit your title and tagline”. Altho I have no intentions in changing the title for this blog. On this writing assignment the topic was “edit your title and tagline”. Altho I have no intentions in changing the title for this blog. 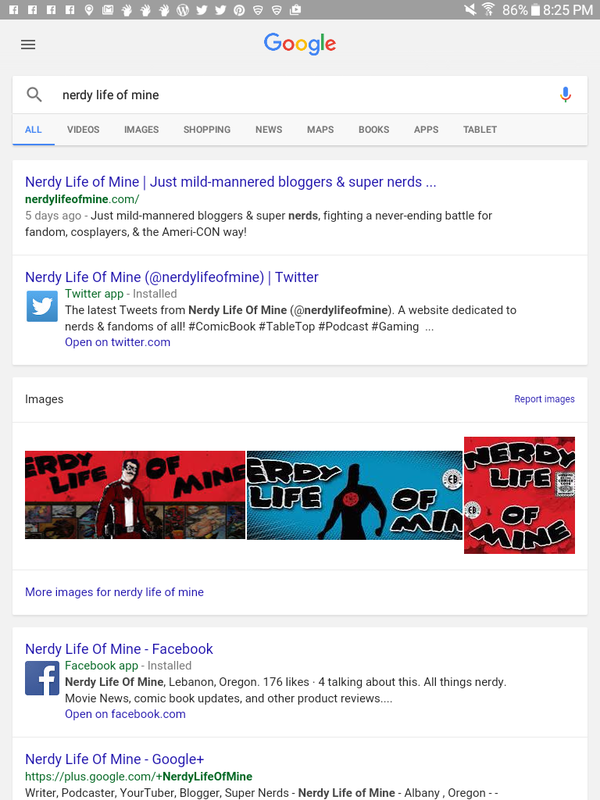 Nerdy Life Of Mine has been the main title for over five years and has became rather personal. Now as far as the tagline, I’ve changed that a few time over the years. This was the current one when you Google my site. I have it written out as “bloggers” & “super nerds”, because I do have some other writers on this blog. But in 2015 I started to let some people go and started to take back my blog for myself. Now I rather enjoyed having people take part in my blog and share their lives or whatever stories. … One sec, Serenity is on….. Watching….. Watching…. Okay sorry about that… Anywho! I liked working with everyone, but I wanted to get back to basics. I want make a lot of changes this year and so far I have. I did change the tagline to, “Just mild-mannered blogger & podcaster! Fighting a never-ending battle for fandoms and sharing all my misadventures in life with you all.” The odd thing is it hasn’t changed on the Google search when you look up my site. Maybe it’ll take sometime, don’t know. I’ll just keep an open eye, maybe I have to be on actual computer to change it (I’m on my tablet right now). Sorry if this post is rather lackluster. But I’m happy with Nerdy Life Of Mine and it’s history, don’t think I’m going to change it. Now you can take this anyway you want really. Like: Who are you as a person and what are you doing with your life type of thing? Or why are you here making a blog for the whole world to see and not keeping a dairy for your own personal business? Rather than getting to deep into the meaning of life, I thought I would stick to the basics and talk about who I am and why do I have a blog/podcasts. I’ve always been big on the blogging scene. I remember starting out on LiveJournal (Yeah remember that? haha!) Then I moved on to Blogger with a blog called Geek Feed. I remember this blog wasn’t anything shocking and rather lackluster. Mostly covering video games and what the newest technology was for that time. Vary rarely I would post anything personal on that blog.. But after 3 years of that, I shut that blog down and started up a new one called Ghosts A GoGo Toons. That was more of a personal blog and I used it showcase my art work that I do. I remember it was mostly a gallery style blog or a portfolio if you will, with vary little writing content. I ran that blog for almost 10 years (almost). Back then I was using Myspace to update my journal or blogging posts. Yes I know Myspace… I’ve been around for awhile and seen the rise and fall of many sites and technologies. But I shut down a lot of my blogs there for awhile, only to keep my Facebook and Twitter. Mostly to keep in touch with my friends and nothing more. I had a lot of personal problems come about that were changing everything and need to focus on that. To figure out where I was going and why? I was rather a dark time for myself and at times I wish not to remember it. But it has built me into the person I am today and that would be the bright side of things. I recall I need an outlet, something I can share my life and the things I was going through. Yet also share things I find funny & interesting. So in 2012 I made Nerdy Life Of Mine! This blog as been a different beast all together. I have learned so much from other people on what to do. I’ve learned so many things on a trail and error bases and I’m happy how things turned out. Sharing everything about my life and helping others with the lessons I’ve learned. This site has also open many of doors I thought I never see open. Podcast for one! I’ve always loved podcasting, just never thought I would be apart of one or make one. I believe this will be my fourth year doing podcasting and now I’m a host, editor, producer. The people I’ve met while doing this are amazing and have become some of the closest friends I’ve had in awhile.. What is odd and great at the same time, is that we never really met in person. Most of them live in Canada or on the east coast of the US. But I talk and work with these people more than some of the other people I work with in person hahaha. There hasn’t really been a pattern or theme to my writing. It’s life and things change, it always changes. But at the end of 2015 and going into 2016 I wanted to try and make a current theme and that goes with my writing as well. I think that’s why I started doing my Star Trek Book Challenge, I love reading and I’m able to read these book rather quickly and write about them once or twice a week. Same thing with my podcasts, I do about 3 to 4 a month and post about them and share the links. Helping make a better body of work and also keep my readers/followers interested in what I’m doing. Going into this year I’ve seen some big changes and doors are slowly opening up for me. I’m able to work as a Press/Reporter for events (like Comic Con) and I wasn’t able to before! I’ve also got to interview some rather big icons and share their stories. So things are looking up! I really don’t have a goal this year. I wanted to focus on fine-tuning my blog and networking skills. I think that’s why I’m taking part in this Blogging 101, I think this will help me get where I need to be and build on my readers. On that note I would like thank everyone who does follow me and reads my misadventures! It really means a lot, because with out you guys. None of this would be happening or possible.